devastated the war-torn East African nation. aid to some areas, according to U.N. officials. civilians to rely on "whatever plants they can find and fish they can catch." nearly three-quarters of all households in the country suffer from inadequate food. Hopkins said, meaning they are at risk of death. 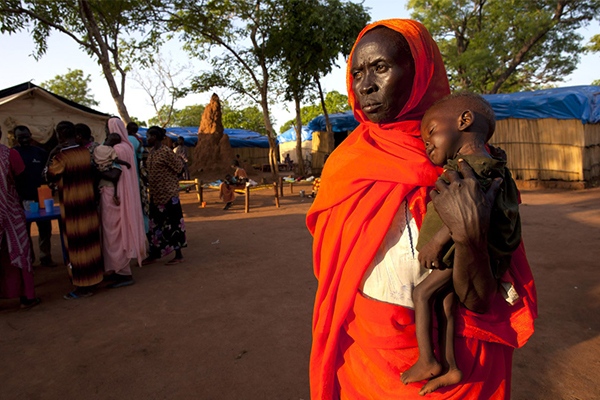 "This famine is man-made," said Joyce Luma, head of the World Food Program in South Sudan. emergency levels of hunger, according to the report. Monday, the U.N. agencies said that unimpeded humanitarian access "is urgently needed." Tens of thousands of people have died since civil war broke out in December 2013, and the U.N.
hundreds of people in July, the war has uprooted more than 3 million people. country's fertile land conditions. During her farewell briefing in November as head of the U.N.
mission, Ellen Loj said that South Sudan has the resources and climate to feed itself. anything," Loj said. "You could feed yourself plenty and I hope peace will come to South Sudan."